Whenever someone asks me for my favourite restaurant in Brussels, my reply is very straightforward: Les Petites Oignons. 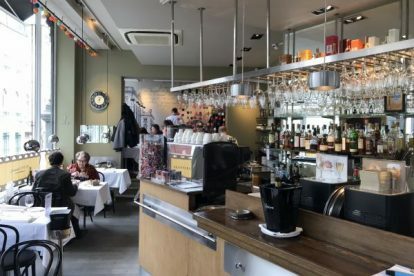 This corner brasserie is the prefect mixture of refined food, elegant setting and first-class service. I particularly like going there because it allows for a cosy meal in a polished environment. Chef Khaled Zoughlami’s menu is sophisticated in taste while at the same time made of time-old ingredients that ensure a hearty meal. My absolute favourite is the sautéed veal liver cooked in the Lyonnaise way and accompanied by fondant potatoes. It is not easy to cook good liver, but at Les Petits Oignons they manage to get the right balance between taste and consistency. Like any decent brasserie, the restaurant also has a wide choice of good French wines to complete the experience. Just so that you know, Les Petites Oignons was my choice of restaurant for our first date with my partner. And it did not disappoint!